Fantasy Flight Games has announced Empire vs. Rebellion, a new stand-alone card game set in the Star Wars universe. 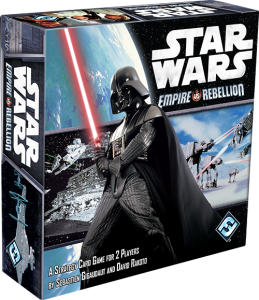 Fantasy Flight Games is proud to announce Star Wars™: Empire vs. Rebellion, an upcoming card game for two players that pits the villainous plots of the Galactic Empire against the heroes of the Rebel Alliance. Star Wars: Empire vs. Rebellion puts in you in command of the Empire’s unlimited reserves or the heroes of the Rebellion and challenges you to tip the outcome of key events in your favor. Every round, you must extend your might and commit your resources towards taking control of the Galactic Civil War, whether you use military power or diplomatic aplomb to achieve your goals. If you can outwit your opponent’s schemes and claim victory in crucial events, you can shape the future of the entire galaxy!